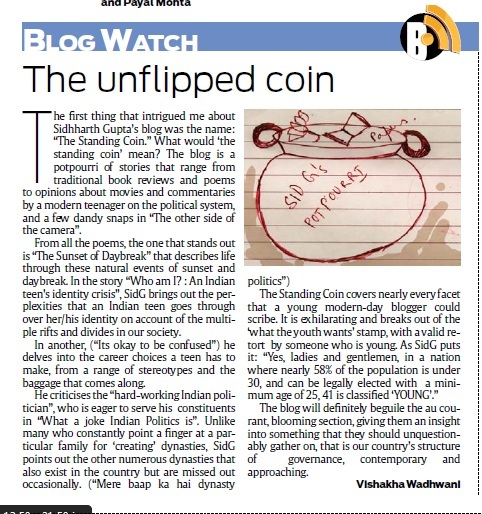 The first thing that intrigued me about Sidhharth Gupta’s blog was the name: “The Standing Coin.” What would ‘the standing coin’ mean? The blog is a potpourri of stories that range from traditional book reviews and poems to opinions about movies and commentaries by a modern teenager on the political system, and a few dandy snaps in “The other side of the camera”. From all the poems, the one that stands out is “The Sunset of Daybreak” that describes life through these natural events of sunset and daybreak. In the story “Who am I? : An Indian teen’s identity crisis”, SidG brings out the perplexities that an Indian teen goes through over her/his identity on account of the multiple rifts and divides in our society. In another, (“Its okay to be confused”) he delves into the career choices a teen has to make, from a range of stereotypes and the baggage that comes along. The blog will definitely beguile the au courant, blooming section, giving them an insight into something that they should unquestionably gather on, that is our country’s structure of governance, contemporary and approaching. This entry was posted in Blog Review, DNA, Mumbai, The Standing Coin.